Its been almost 15 days to be exact that I last wrote about mumbai visit part 1 . But what to do, I had to make another visit to mumbai after that ,so , I thought I would sum up the visit in my next blog here. So last time, I explained that , i would tell something about the people there. common people to be exact.Contrary to the popular belief , people there mind their own business and do not interfere in other's matters or affairs, but if someone asks them for a small help, they do oblige. That's my own personal experience. I had many times asked strangers at the railway stations if a particular local train would take me to my desired location just to be sure that I am not late and end up reaching somewhere, and they have readily obliged by giving me the right direction. The people there are also somewhat miser, when they have to shell out money change, specially the shop owners in and around the railway stations. Even if they have piles of coins lying around them, they say they dont have change when one wants a mere 5 ruppee change for phone calls .And i thought that only Ahmadabad guys are misers. The tourist places literally loot the people of their money also thinking that all people who come there are rich and would have thousands of bucks in their pockets. After my exam ended at 12 pm, i went straight to marine drive which was just a half kilometers from the exam center. Having spent around 45 minutes there, I went again to the Gateway of India to pass time as I had nothing to do the whole day and had to catch my train back at midnight only. Last time i had visited my cousin , due to lack of time, we could not go to Eliphanta Caves situated at backside of the Gateway of India. So I saw myself suddenly taking the ticket and sitting on the ferry boat with other passengers on my way to Eliphanta Caves. It took us around half hour to reach the destination. It was such a joy to be among deep sea water around you once again after many many years. But regretfully, we have also made the sea dirty as hell. uptil 5 km atleast, you can see the dirt and other pollutants sailing along the sea. It makes you think, that on one hand, we complain about the pollution and ways to control it, and on other hand, we ourselves do this to our natural habitats and environment. I wish I could show you uptil what extent the sea was polluted , but I did not click pictures of the dirty water there. the ferry amusingly charges 10 Rupees extra for going to the upper deck to have a full view in addition to 120 Bucks charged for transportation. Thats what i was talking about looting people. So , we reached the destination in around half hour or so. The place can be called as an island itself. What a beautiful place! From the deck to the staircase, there is a toy train which takes people there in case they dont choose to walk all the way. from staircase, you have to walk up around half a kilometer up with small shops lined up on both sides selling sea articles and other related things. They take entry fee as usual to get in the caves area. 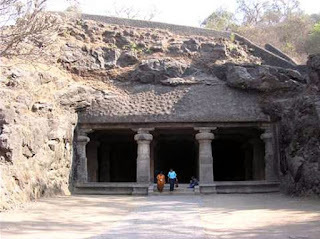 The Eliphanta Caves are around thousands of years old dating back to year 450 and 750 AD when the island was known as Gharapuri (Place of Caves). The Portuguese renamed the island Elephanta because of a large stone elephant near the shore. The statue collapsed in 1814 and the British then moved it to the mainland. There are around 10 caves there with spectacular ,extraordinary , marvelous statues which the modern architects can hardly think to make still standing today. Although , some of them are damaged owning to time and lack of proper care but they are excellent to watch. Mainly the statues consist of Shiva and Parvati and Buddha statues . Statue of Natraja and others are treat to watch with one statue of Buddha meditating. Like I said, the modern architects lack the vision and strength to make these type of structures. If at all they make, I doubt , how many years these structures can stand tall after 30 years. The people who made these things or statues to say must have been great architects, visionaries, and greatly talented to say the least about them. I was left wondering on how can such great things be made completely out of solid rocks and given the proper turn in case of women statues. 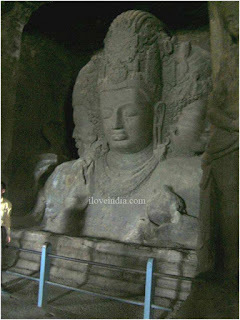 There is around a 20 feet idol of lord shiva with 3 heads. Wow! With proper face and jewels worth of Shivji. Once again., dont have proper words to express what i saw. Now , I will show you the big shivling and the 20 feet statue i was talking about of lord Shiva. After seeing this wonderful structures, I went for a short trekking up on the hills where there is a land owned by Indian Navy and where there are 2 big cannons kept for display. I soon reached to the top of the island where I could see the whole Mumbai ahead with the sea in front of me and also the whole area around me. I could say for that moment that I was on the top of Mumbai or world. Lets see some of the pics of which i am talking about here. I had estimated that I would come down around 2-3 hours when i went there from Gateway of India and join my friend for a movie, but it took me around 5 hours to come down and half hour extra to reach back and join my other friend for dinner. To say the least again of Mumbai railway station, one station I liked most is the Churchgate station.. I would request you all to go to this place once in a lifetime and enjoy the beautiful structures of those people back then. and yes, whenever you go out in the sea or any other natural environement, please dont pollute it.these all places are our places and we need to preserve it.atleast for future generations. greats pics with cool account :)..
hmmm..khoob ghooma ja raha hai..
keep sharing ur experiences..nice to read them..
its true.. peoples at Mumbai are really helpful. They will help you at every step. Actually they know everything, because local trains are so managed. But beware, if you come Delhi. don't ask anyone for help. Believe me, ask 10 peoples and you will get 10 different answers and finally you will end up being irritated.